The Center for Constitutional Rights (CCR) and others who are involved in the legal challenge to the lack of media and public access to court filings, legal docs, etc. (let alone transcripts!) 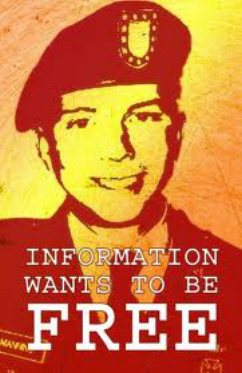 in Bradley Manning’s Court Martial, will have their appeal to the Court of Appeals to the Armed Forces heard on 10 October. Other parties to the action are Glenn Greenwald, Jeremy Scahill, The Nation, Amy Goodman, Democracy Now! Chase Madar, Kevin Gosztola, Julian Assange, and WikiLeaks. The military’s highest appeals court has announced that it will hear oral arguments next month on a bid to allow the press and public direct access to records relating to the pending court martial of Pvt. Bradley Manning, the Army intelligence analyst accused of leaking hundreds of thousands of diplomatic cables and military reports to WikiLeaks. reports Josh Gerstein at Politico. It is timely to be reminded again, that, although, technically, Brad’s court hearings are ‘public’ (though some sessions are actually ‘closed’), the restriction placed on the information being accurately and thoroughly relayed to the public by the almost complete bar on access to the documents in the case, exceeds even that in alleged ‘terrorist’ trials at Guantanamo Bay. In practice, the resulting difficulty in transcribing and interpreting the proceedings means that mainstream media are discouraged from attending/reporting, and correspondingly fewer people are made aware of the travesty that is masquerading as justice in Bradley’s ‘day in court’. And no doubt this is the intention. The fact that the proceedings are also so protracted obviously compounds this, with the Court Martial having begun at the Arraignment in Feb 2012 and only looking to get to trial by Feb 2013. This makes the case expensive to cover. (As has been previously mentioned, it has also put a huge additional financial burden on the funding of Bradley’s Defence). The only access to documents we have is on David Coombs’ blog where he posts the defence motions when he is permitted to do so. These are redacted by the government, so that names are deleted, as are any parts of the prosecution’s motions quoted by Coombs in his argument, and this obviously reduces their usefulness. Much of what is being discussed or litigated in court involves complex legal argument or complicated detail around evidence, as well as names which are easily misheard, and you need to be really committed to keep up with it. No electronic devices are permitted in the court room at all, so reporters have to be on the ball to get down all that’s going on just with a pen and paper. And you get just one shot at it. Under these circumstances, we are blessed to have such dedicated and efficient reporting under pressure from Kevin Gosztola at Firedoglake’s the Dissenter, Alexa O’Brien @carwinb, and Nathan Fuller who reports for Bradley Manning Support Network, and thanks are due to them for their persistence in maintaining so thorough a record of such an historic case. You can support their continued reporting by donating: Kevin Gosztola, Alexa O’Brien and Nathan Fuller. Until the last few hearings, there was an allocated media room, which at least meant that reporters could access their computers during closed sessions or breaks, but this has not been ‘available’ the last few times for apparently spurious reasons such as it being in use for other purposes (including someone’s retirement party – hmm). You may remember that, back in March, a broad based media coalition of 46 parties wrote a letter of complaint to General Jeh Johnson (general counsel of the Defense Dept. and a campaign adviser to Obama) about the lack of access to court documents in the case. This was sent under the banner of the Reporters Committee for Freedom of the Press. The prosecution of an American service member for the alleged leak of the largest amount of classified information in U.S. history is a matter of intense public interest, particularly where, as here, that person’s liberty is at stake. Public oversight of the proceeding is of vital importance. Indeed, the interest in openness in this case is not mere curiosity but rather a concern about the very integrity of this nation’s military courts — their ability to oversee the proceedings by which military personnel have their day in court to answer to and defend against allegations of serious offenses. The inability to view court documents filed in connection with a particular judicial proceeding burdens the news media’s constitutionally protected right to collect and disseminate the news and severely curtails journalists’ ability to do their jobs effectively. The amicus brief filed with the military’s highest court, the Court of Appeals of the Armed Forces, supports a request from the Center for Constitutional Rights to allow public access to motions, briefs, written rulings and the docket in Manning’s court-martial. While hearings in Manning’s case have been in large part public, the motions and briefs the prosecution and defense are arguing about are not available from the court. So, those watching the arguments often have trouble understanding precisely what the lawyers are arguing about. Military prosecutors have urged the court to reject the request for direct access to the court-martial filings. Prosecutors say the public can seek to access the records through the Freedom of Information Act, although that process is almost always untimely and the military has flatly rejected past request for Manning related records. It is ridiculous (counter-productive – we hope! – and definitely stoopid), but especially it is cynical, to answer the fundamental right of the public to information on the documents in Bradley’s case by pointing the petitioners/plaintiffs to FOIA, when a) the govt. take ages to respond to such requests (and plainly speedy access is of the essence! ), and b) they have previously denied them! For the icing on the cake, the prosecutors also said in their response that, as there were no FOIA requests pending, there was clearly no demand for these documents to be publicly available! Firedoglake therefore set up a form for people to add their names to new FOIA requests filed by Kevin Gosztola to demonstrate demand, and thousands of people signed up! For more background and to track how the case has progressed see Kevin Gosztola’s posts in March [1,2], May, June, July and August. A military court, the Army Court of Criminal Appeals (ACCA), issued a one sentence denial when we requested the court hear our lawsuit. The lawsuit moved up to the Court of Appeals for the Armed Forces (CAAF). The government responded to filing of the suit. For more interesting details see also Kevin Gosztola’s 7 September post as the CAAF announces the 10 October hearing date. …the case is shaping up to be a critical First Amendment case that has the potential to usher in much needed transparency in American military justice. Hopefully, the ‘amicus brief’ is also an indication that the unwarranted restrictions being applied to Bradley’s case are provoking some mainstream media response. The pervasive secrecy underlying the Manning prosecution has reinforced and indeed fueled a theory that the US government keeps far too many secrets in an attempt to evade public oversight of its misconduct. Gallery | This entry was posted in Analysis, Manning and tagged Bradley Manning, Court Martial, letters, media, reporting, transparency, US. Bookmark the permalink. The US Government has a penchant for keeping a cloak of legality (righteousness blessed by itself) while all the while promoting grievous harm to individuals. The actual physical harm of course is done by its enforcers, those willing to initiate physical force. The fact that Bradley Manning, a military support personnel (“intelligence”) sought to make non-enforcers aware of some of the harm (to non “military targets”) being perpetuated by troops, is a situation that those in Gov will not tolerate. He must be prosecuted (and even physically eliminated) as an example to continue and increase the fear that any current enforcers may experience when considering doing the same. At the same time the heavy veil secrecy is to keep the far more in number non-enforcers from being aware of the details and frequency of the government’s own harm-promoting activities to be carried out by enforcers, sometimes even on fellow enforcers. The major lesson to be learned by non-enforcers: DO NOT JOIN the military. IF currently in the military, do NOT RE-ENLIST (“re-up”). Be aware that each individual is responsible for his/her own actions, even when a government enforcer and given/issued orders (words) to do harm to others. Encourage others to not be a part of the military in any position, no matter the enticements used by recruiting parties; encourage and support ways in which young men and women can be productive while not a part of government.